This time we have something different from the green fields, coast and cork hills of the Baix Emporda. 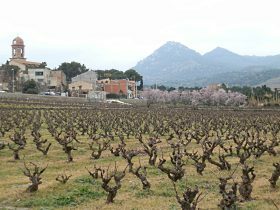 Espolla and Rabos are towards the mountains that border France in the Alt Emporda region. As you move northwards off the Empordan plains, the routes into the mountains both at Espolla and out towards Cap de Creus become more barren with sharper stones under foot. The fields give way to vineyards and olive groves built on levelled fields surrounded by dry-stone walls that look as they were built hundreds or thousands of years ago. 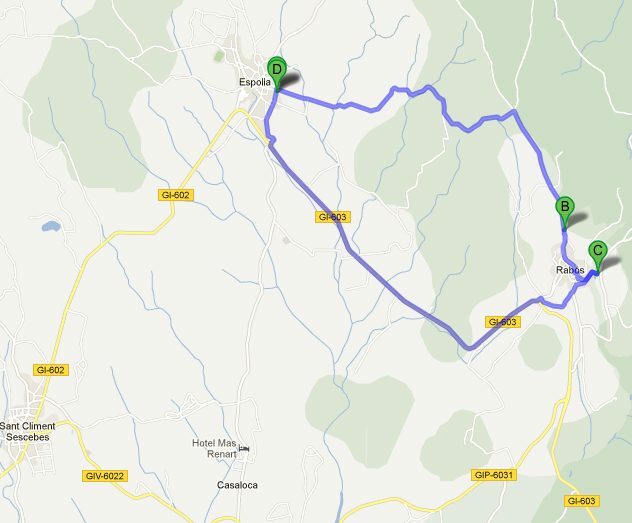 We headed towards Espolla on a whim after having visited Peralada. Our map at 1:50000 wasn't so great so we really lacked any good walking directions, but the route between Espolla and Rabos seemed as if it would at least give a taste of walking in this area and perhaps provide some experience for planning some other walks up towards the Albera mountains. 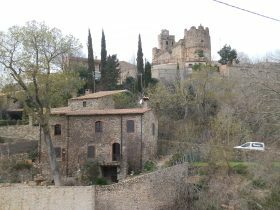 Espolla is a small town surrounded by vineyards with a small castle and a prominent church. It's feels far from the tourist track and is more of a regular work-a-day Catalan village. The paths are well marked from the village and there is a route over the mountains to Banyuls sur Mer (Banyuls de la Merenda). The day was quite overcast - February is the month with the greatest chance of snow and days oscillate between warm sun-filled days and chilly evenings presaging the start of spring, and overcast days with threats of rain or sun. The path follows a track among the vineyards and olive trees into the hills. It feels quite dry and isolated and there aren't many specific points of interest. The olive groves and vines are well tended though (we discovered later than Espolla olive oil is renowned in Catalonia) and there are shotgun cartridges almost all the way along the path indicating its attraction to hunters - when we got back to Espolla a large group with dogs and 4x4s was preparing to go out. As the path turns over the hill and back down towards Rabos, there are the first glimpses of views down towards the sea and the Emporda plain, though it was too overcast for us to be able to see clearly. For the walk back to Espolla we followed the road. It wasn't busy, but next time we come up here we really have to have better maps.